For this month's "Maps Of The Month" featurette, I wish to draw your attention to DarkWolf's Haunting: Starring Polterguy (Genesis) maps. After being killed in an accident involving defective skateboards manufactured by Vito Sardini, Polterguy, now a poltergeist, seeks revenge on the Sardini family. By using his powers of possession, Polterguy can control and haunt hundreds of household objects to scare the Sardini family out of four different homes. This game is unique in its premise, or at least the use of possession as a gameplay mechanic was fresh in 1993, predating 2000's Messiah (PC) and 2005's Geist (GameCube). The possessions can be startling, gross, or downright disturbing. Ultimately the Sardinis are scared out of a house, only to move into another one, but Polterguy pursues them, and each house is bigger than the last, furnished with different things to possess. DarkWolf has indicated all the "Fright 'em" points (indications of items that can be possessed) on these isometric maps. He has even made aesthetic versions of houses without those marks and showing what they would look like if all the rooms were continuous. That goes beyond the effort most would do...or shall we say, the great beyond! DarkWolf actually made these maps long ago, but was somehow overlooked, and finally gets its long-deserved recognition this Hallowe'en season. 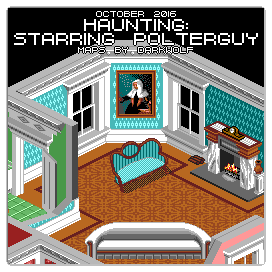 So to recognize the effort put into taking possession of these houses, DarkWolf's Haunting: Starring Polterguy (Genesis) maps will be known as VGMaps.com's Maps Of The Month for October 2016.